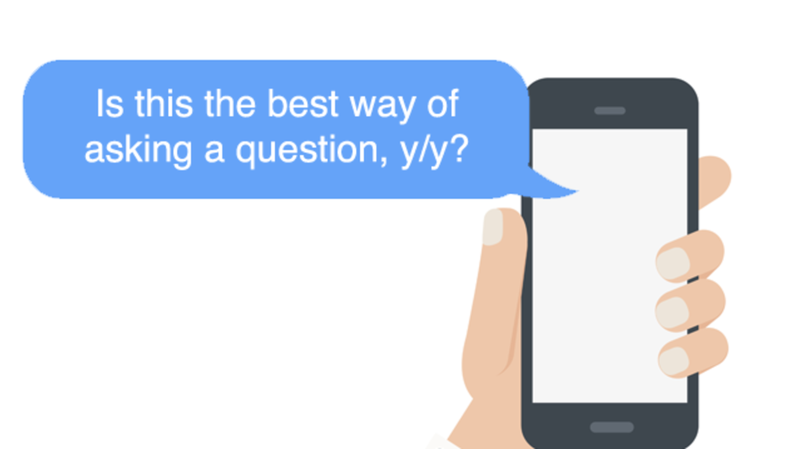 Why Have People Started Asking Questions by Adding 'Y/Y'? This is the best new way of asking questions, y/y? Some examples from around the internet show how this method of appending a y/y to the end of statements is starting to be used. So I should wear my matching shirt at some point, y/y? So, Ramsay is the new Joffrey but 1000x worse, y/y? #knitting friends. We should all make these for next winter, y/y? I have a million of these flower dresses and I need another one y/y? the weirdest hat he's ever worn, y/y? Technology is a blessing and a curse, yes or yes? Full-on "yes or yes" is often found with questions, as sort of extra reinforcement that makes it into a rhetorical question, while "y/y" tends to be found with statements, making them into questions. In fact, while it sounds OK to say "yes or yes" with a statement ("technology is a blessing and a curse, yes or yes? "), it sounds downright weird to say "y/y" with a question ("*do you like kale, y/y?"). And that means that the "y/y" construction is actually something more interesting than just an abbreviation of "yes or yes"—it's a new example of a phenomenon called a tag question. A tag question is one formed by adding a short word or phrase onto the end of a statement. Other ways of forming tag questions in English include isn't it, doesn't s/he, correct, OK, and right. Your cat plays the piano, doesn't she? It's not going to rain today, is it? We're having dinner soon, right? And that's how it is, OK? And then you saw the witness again on Tuesday, correct? That's an expensive car, eh? We'll get together this weekend, yes? So with y/y, English is kind of sneaking in the back door and letting in a full-fledged tag question based on yes. I've found a few examples of "no or no" (Is it too early to start drinking? no or no) but I haven't spotted anyone using its tag question, "n/n," yet.